This is a one-of-a-kind Apple Macintosh (IIci?) packages as a touchscreen with an added gooseneck webcam by Dan Croghan., then at Apple. Click here for pictures of the MIKO or read on.. 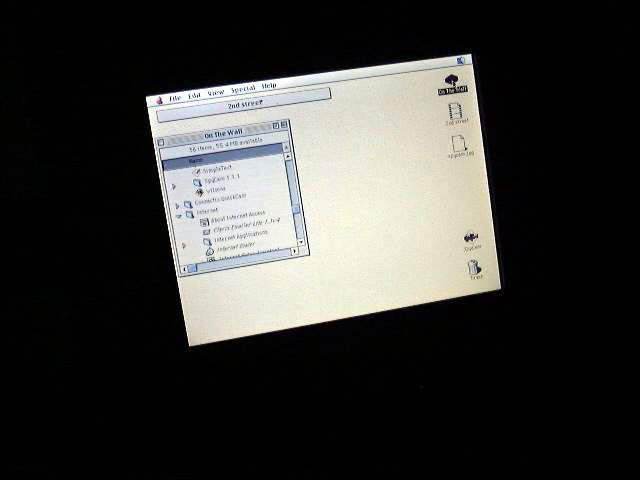 The Mac OS was considered the platform of choice for multimedia applications in the 80's and 90's. Windows and other operating systems have caught up, and for now are more widely used in kiosks. The MIKO is no longer produced as far as I can tell. The name MIKO stands for Mac Inside King Outside. There were a couple of versions made by King Products in Canada. Both were built from PowerBook 540 laptops (the "Blackbird" model originally plagued with the occasionally combusting battery). You have both the Plynth and the wall-mounted models at the 'Barn. Basically it is a 540 with its original drives and display remounted in the kiosk shell. 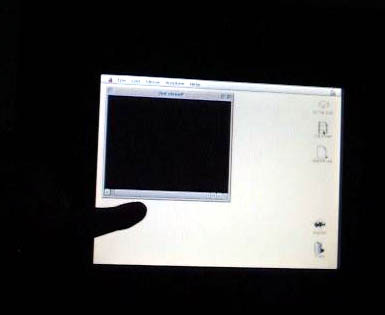 An ADB touch screen is used for interaction with (typically) MM Director-based content. 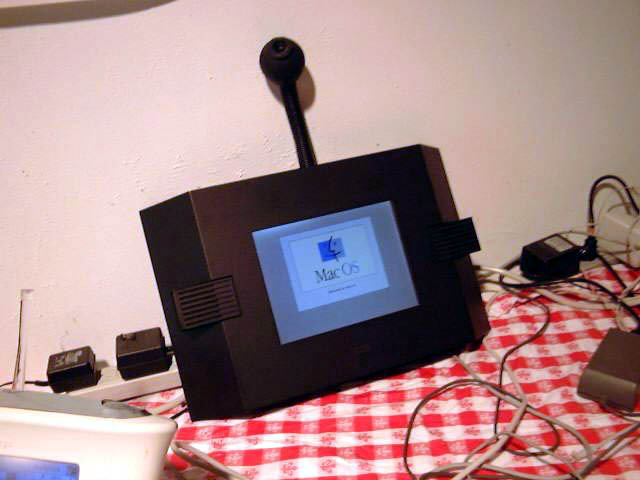 A stereo amplifier nicely drives the speakers on the kiosk. An external power supply is used since these are built to run continuously. There is a minor mod to the 540 motherboard so that startup/boot of the computer happens when it's plugged in since the keyboard is usually only attached for maintenance or programming. 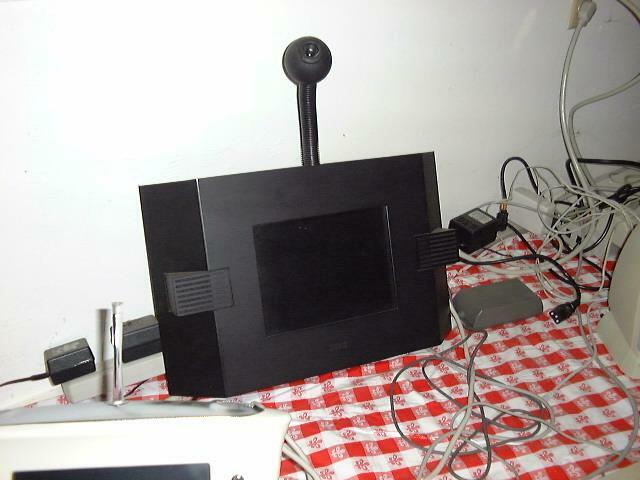 I added the gooseneck-mounted Connectix QuickCam and a 10BT ethernet adapter in 1998 while at Webcast Solutions in San Francisco. I also performed the PowerPC 601 processor upgrade to these machines. These were done to make the unit a prototype kiosk for image capture and upload use. It will also collect periodic images and compile them into time-lapse QuickTime movies using Spycam software originally developed at Apple for webcasts from Comdex, and the Grammy and Cool Site of the Year awards shows. These kiosks were placed at these events to display the event site, and to capture still frames from parties or other behind-the-scenes locations which were then uploaded to the site. The unit with the camera seems to have evolved at King into this product. The Plynth now looks like this. Here is another article about Apple and the MIKO. 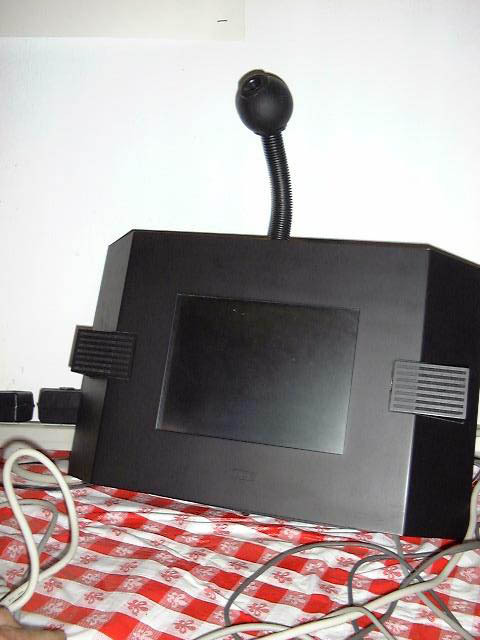 I have several programs which were run on these kiosks originally if you prefer that to the Spycam software they run today.